Animonda Milkies Cat Snack are delicious, crispy treats for cats. There are 4 varieties of the snack available, each beneficial for your cat's health. 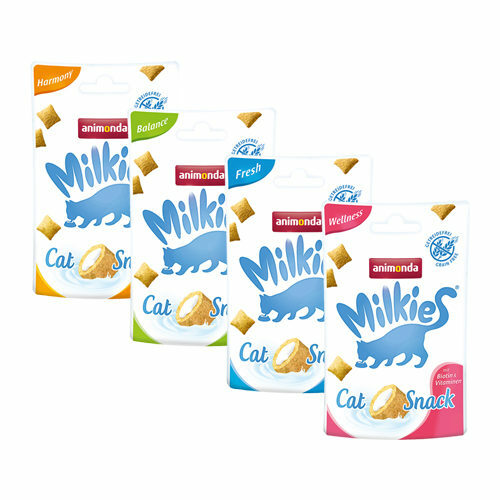 Milkies Cat Snack from Animonda are delicious, crispy snacks that your cat will not be able to resist. The tasty snack is available in 4 different flavours, each with a positive effect on your cat's health. No wheat and/or soy has been added to this snack. Moreover, this healthy snack only has 1.5 kcal. Animonda Milkies Cat Snack - Wellness: with biotin and vitamins, which encourage a supple skin an shiny coat. Animonda Milkies Cat Snack - Fresh: aids in reducing the formation of tartar and plaque. Animonda Milkies Cat Snack - Balance: with omega-3 for an encouraging effect on the agility of your cat. Animonda Milkies Cat Snack - Harmony: aids in reducing hairballs. Animonda Milkies Cat Snack - Wellness: meat and animal byproducts (poultry), vegetables, oils and fats, vegetable protein extracts, vegetable byproducts, milk and milk products, seeds and minerals. Animonda Milkies Cat Snack - Fresh: meat and animal byproducts (poultry), vegetables, oils and fats, vegetable protein extracts, vegetable byproducts, milk and milk products and minerals. Animonda Milkies Cat Snack - Balance: meat and animal byproducts (poultry), vegetables, oils and fats (including 2% salmon oil), vegetable protein extracts, vegetable byproducts, milk and milk products and minerals. Animonda Milkies Cat Snack - Harmony: meat and animal byproducts (poultry), vegetables, oils and fats, vegetable protein extracts, vegetable byproducts, milk and milk products and minerals. Have you used Animonda Milkies Cat Snack before? Let us know what you think about this product.